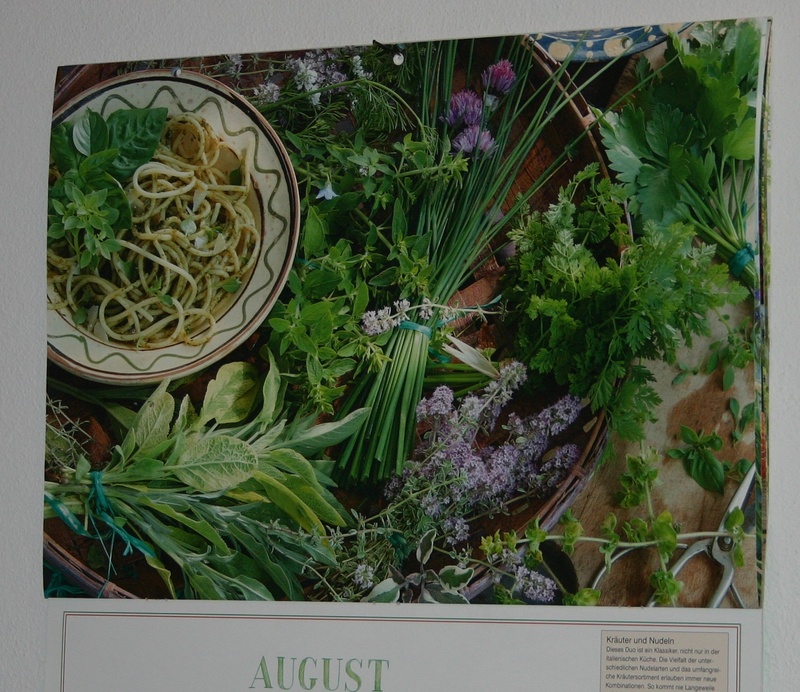 When I turned over the page of my kitchen calendar for August I immediately knew I must try this recipe! It uses herbs I have in my garden, especially basil, which I posted about here recently. After tracking down some Ricotta (I live in an uncivilized part of the world where people don’t seem to stock it! ), I was hoping to take a lovely photo of it in the Sunday summer sun… then we had a major storm and had to turn all the lights on mid-afternoon! Cook your spaghetti. Meanwhile sauté the onion and garlic until soft. Add the cherry tomatoes and allow to cook down. Then chop the herbs and add, cooking for a further two minutes. Stir in the ricotta/vegan sour cream at the end, and heat through. Season with salt and pepper and serve over the spaghetti with parmesan or vegan parmesan cheese. This entry was posted in Food, Herbs & Spices, Recipes, Vegetarianism and tagged Food, Herbs, Recipes, Summer, Vegetarian. Bookmark the permalink. Sun-dried tomatoes would be a good idea. It’s a surprisingly riich flavour with the sweetness of the cherry tomatoes, but light at the same time. Hope you find some ricotta to make it soon! I’ve read about making your own, but never tried it…. worried it might not be quite the same! Mozzarella and tomatoes go so well together, and my basil needs using up now the nights are getting cool! Thanks Susan. It’s looking pretty calm this week Nancy, but I’ll keep puffing in your direction, and who knows…?! 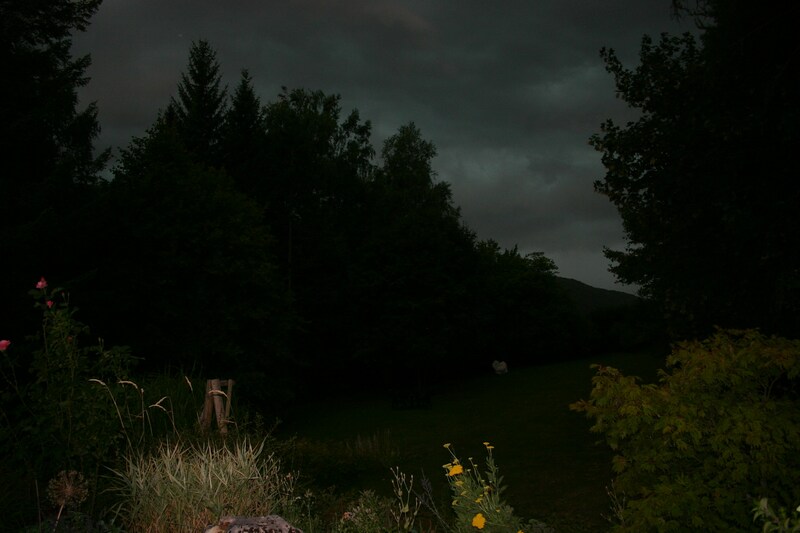 It was a great storm – the temperature dropped from about 36°C to 20°C within about an hour! I’m smitten with all those lovely fresh herbs paired with sweet seasonal cherry tomatoes! A vibrant summer feast! That spaghetti looks divine! What time did you take that dark outdoor picture? It was about 3pm! The automatic outdoor light came on it got so dark, and it was quite spooky! 😉 We were so pleased for the cooler temperatures after though. 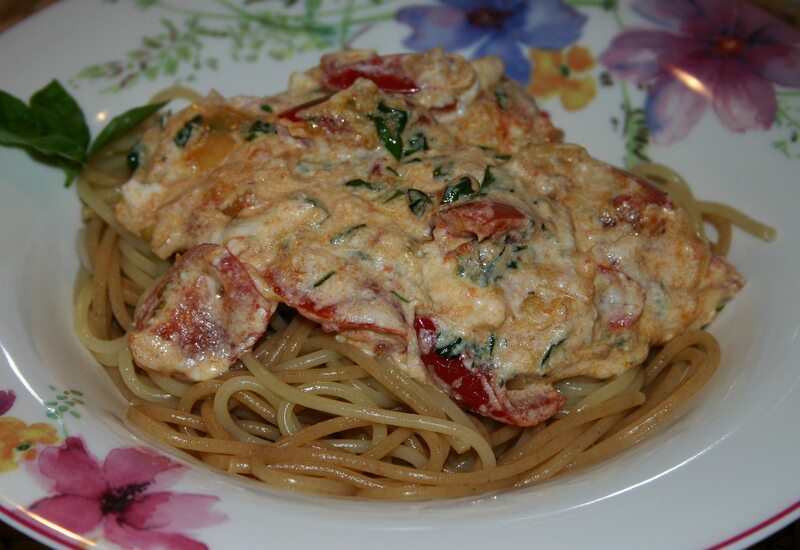 That looks wonderful – I love spaghetti, but rarely make it with a creamy, cheesy sauce. Looks like it was quite an impressive storm you had! Very windy with significant rain, and fortunately no damage – just lots of dry twigs and leaves everywhere to tidy up. The garden was happy afterwards! This was a new sauce for us too – quite rich but so tasty with the sweet tomatoes. Thanks for translating! I could decipher some of the ingredients but not all of them! It sounds and looks delicious and as I always say around this time of year, “We are headed into pasta season!” That is because we eat more pasta in Fall than any other time of year due to the influx of fresh tomatoes and various herbs, plus I am making many batches of marinara sauce usually. Thanks for sharing! No ripe tomatoes yet – I keep checking several times a day, but not even signs of red yet! Enjoy your weekend too Annette! 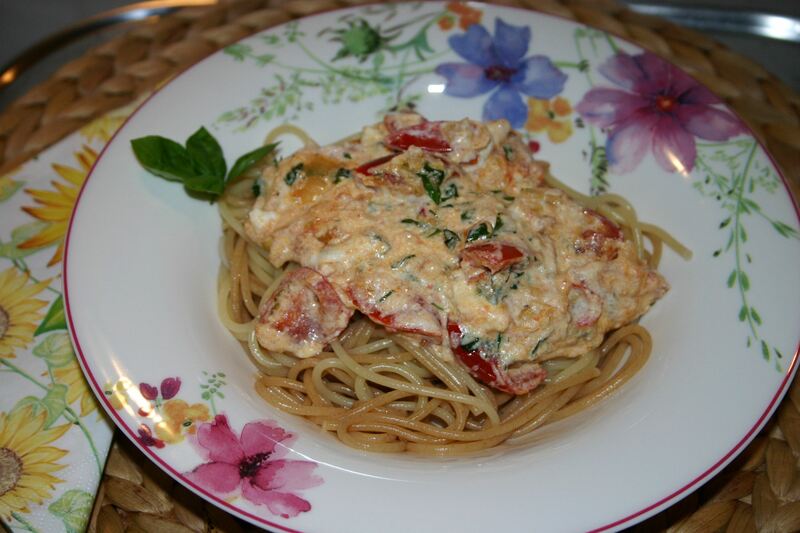 Summer Spaghetti look very delicious! Some tomatoes are red and all these herbs are growing in my garden. 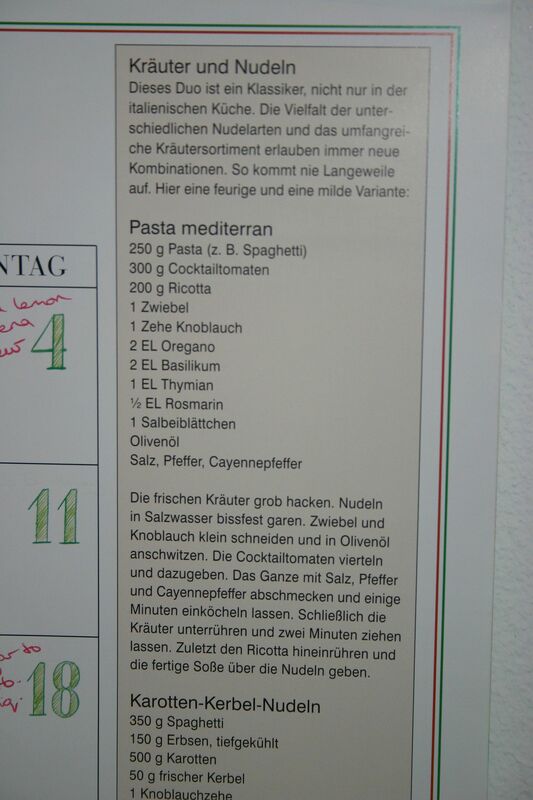 I´´ll try this pasta tomorrow…, can hardly await to enjoy it…! Have a sunny summer weekend in your garden, Cathy! Thanks Cathyo – nice of you to stop by! It was a little scary! Looks fantastic. Given that I am on my own this week, with Judy taking another trip, I may try to make it myself. Doesn’t look too hard, though I think I will use diced tomatoes instead of cherries.